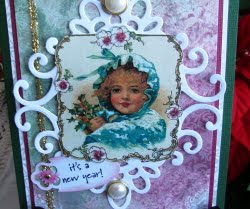 Vada's Blog Stamp Inks and Paper : To Wish You a Happy New Year. to the image,along with colored pencils and highlighted with white gel pen. 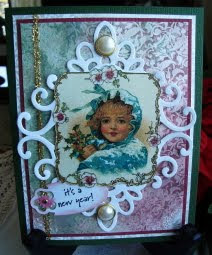 The corner die is from “Heartfelt Creations”. A delightful card. The image looks fabulous after your 'modifications'. Its Beautiful Vada, so much vintage lovely-ness. that background is just yummy! 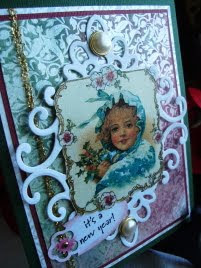 Vada, your cards are always amazingly beautiful and this is not different. Love how you framed that beautiful image! Happy New Year!